A special issue of the journal Bautechnik (Structural Engineering) comes out on the occasion of the 90th birthday. Some of the most significant milestones in the field of structural engineering (new processes, materials, structural concepts) of the past 90 years are presented in a special way. 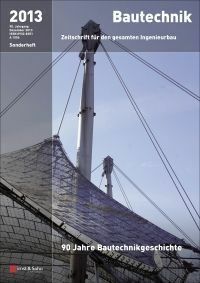 Renowned authors comment and evaluate each milestone from today's point of view and make the connection to developments in structural engineering in the past and the future. The significance of these technical innovations is supplemented and demonstrated with historical articles from the magazine Structural Engineering written by well-known authors who were involved at the time. Saving and cost reduction, greatest possible economy and efficiency, resource management, quicker construction progress, increased load-bearing or longer spans are undoubtedly a feature of modern times. These key points are reflected in the innovative solutions illustrated by the milestones of construction history documented in this special issue.